Here are five enjoyable websites. — “The Average American Mall Experience in Six Charts” has fascinating facts about America’s malls. The most over-represented food category in New England is donuts. In the Southwest, it’s gelato. The most common mall store is Sunglass Hut. 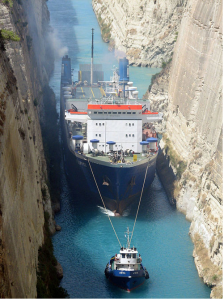 –“19 Awesome Things You May Not Have Seen Yet” includes a tiny tugboat pulling a giant ship through the Corinth Canal in Greece, a water bridge suspended over a river in Germany, and the second-hand phone market in China, with huge piles of phones. –“Japanese Hotel Staffed by Robots” brings you an article about the Hen-na Hotel, which translates to “strange hotel.” Its robots check you in, carry your bags and speak to you in Japanese, Chinese, Korean or English. Guests can unlock their rooms through facial recognition. — YouTube.com/pbskids has hundreds of kid shows from PBS. Bob never liked Sesame Street but he may not be the right audience. Target age: 2 through 8. Some of them truly inspired me a lot.